McClain’s Kyla Burchett tags second base and turns to throw to first as Fairfield’s Lauren Arnold approaches the bag on Saturday at Fairfield High School where the Lady Lions hosted McClain and Piketon in non-conference tri-match of softball games. 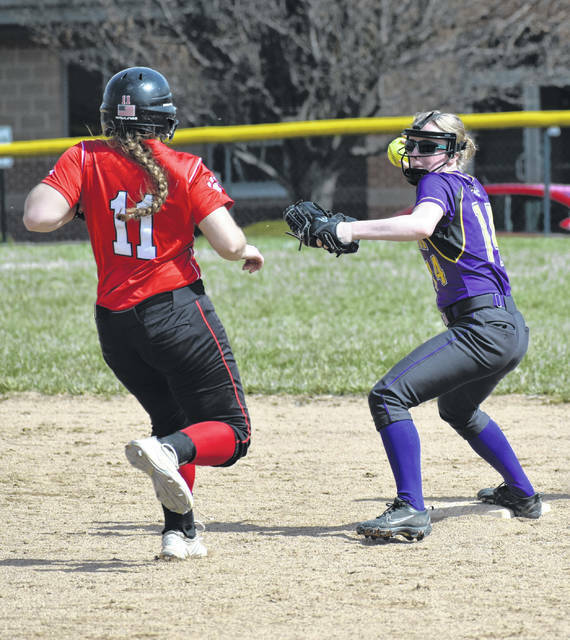 The Fairfield Lady Lions (9-0, 5-0 SHAC) hosted a tri-match with the Piketon Lady Redstreaks (4-3) and McClain Lad Tigers (4-4) on Saturday at the Fairfield Baseball and Softball Complex. Fairfield continued its winning ways with a two game sweep, defeating Piketon 13-0 and McClain 3-1. Kaiti White was nearly perfect versus Piketon throwing a no hit shutout while striking out 12 batters. White also gained the victory over McClain allowing just four hits and striking out 11 Lady Tiger hitters. Fairfield scored early and often in the Piketon contest with three runs in the first inning, six runs in the second inning, two runs in the third inning, and two runs in the fourth inning. Leading hitters for Fairfield in the Piketon game: Lyndee Spargur (2 for 3, 2 runs, 1 rbi), Megan Gragg (2 for 4, 3 runs, 1 rbi), Kaiti White (1 for 3, 2 runs, 1 rbi), Layla Hattan (1 for 3, double, 4 runs, 1 rbi), Lauren Arnold (1 for 4, 4 rbi), Hayleigh Lowe (2 for 4, 1 rbi), Ashley Sanderson ( 0 for 2, 1 run), Molly Thackston (2 for 3), Halle Hamilton (1 for 1, 1 run). McClain would take an early 1-0 lead in Game 2 with a run in the top of the first inning. Josie Crabtree led off the inning with single and scored on a double to the left centerfield gap off the bat of Beckley Smith. The score remained 1-0 until the Lady Lions rallied to score two runs in the bottom of the fourth inning. With one out White reached first base on an infield single. Hattan stepped to the plate and promptly tripled home Lowe running for White. Arnold then followed with a single to left field to drive in Hattan. Fairfield would add an insurance run in the bottom of the fifth inning. With one out, Gragg singled up the middle and White followed with an infield single as Gragg moved to second base. Hattan then singled to centerfield to drive in Gragg. Leading hitters for Fairfield in the McClain game: Spargur (0 for 4), Gragg (1 for 3, 1 run), White (2 for 3, 1 run), Hattan (2 for 3, triple, 1 runs, 2 rbi), Arnold (2 for 2, 1 rbi), Lawson (3 for 3), Sanderson ( 0 for 2), Crum (0 for 2), Hamilton (0 for 3). McClain also took on the Lady Red Streaks in the second game of the day and come away with the 7-0 victory. Fairfield Assistant Coach Tom Purtell submitted this story.